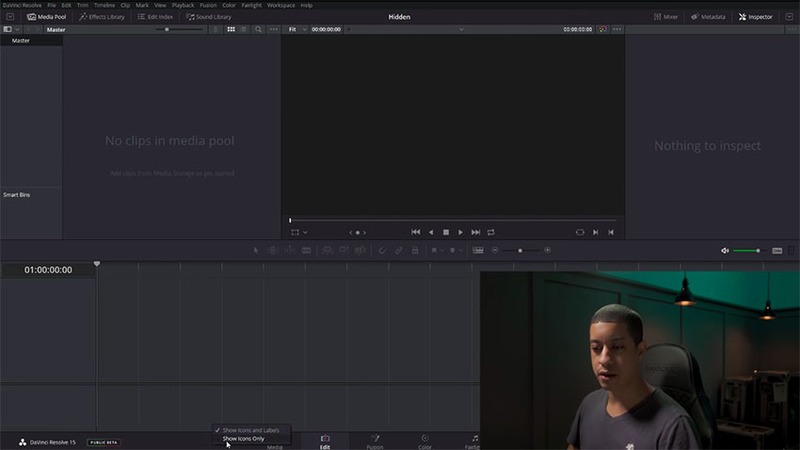 Over the years, DaVinci Resolve has evolved into both a powerful color grading application and feature-packed NLE with all the bells and whistles one might ever need. In fact, the software has matured to the point where some Final Cut and Premiere Pro users have switched to Resolve 15 as their primary video editor of choice and never looked back. Even though there’s a multitude of tools and features already available on the platform, you may be surprised to learn that there are even more menus and options inside of Resolve. A video on the JayAreTV YouTube channel covers a few of those less known functions, that might also help you work more efficiently and intuitively when editing in Resolve 15. 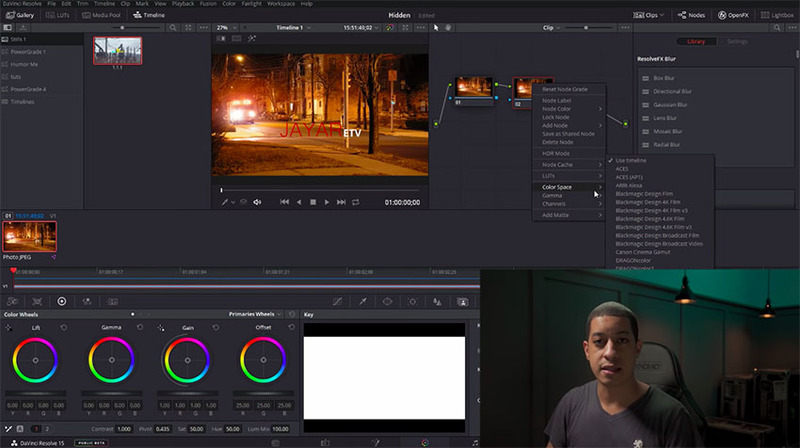 If you’ve ever used Resolve, you’ve probably noticed that the top and bottom menus contain both an icon and text labeling each aspect of the program. By right-clicking on these menus, you will find an option to Show Icons Only. By enabling the feature, the top and/or bottom menu(s) will only display the icon, giving you more space to work with when editing. 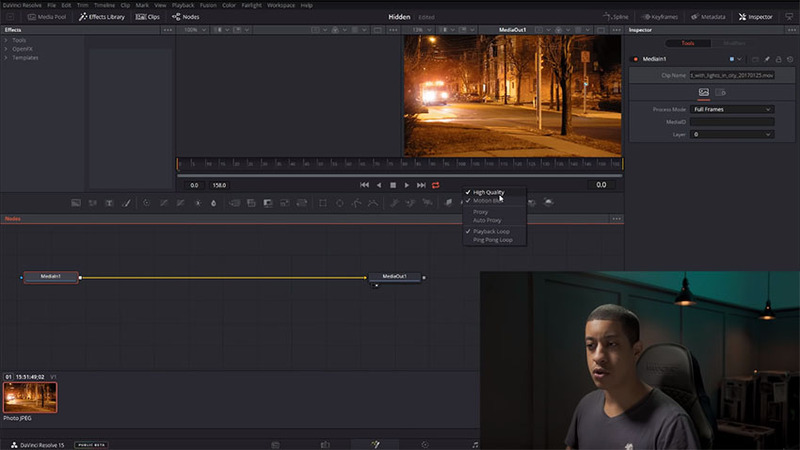 When working on visual effects in the Fusion tab, you may also find that some effects such as motion blurs may slow down your system, thereby affecting playback performance. If you right-click on the preview window, you can access an option to disable Motion Blur. By doing so, any motion blur will be disabled in the preview. Nonetheless, it will still appear in the final render. In addition, you can also choose to deselect the High-Quality preview option for smoother playback. This is particularly convenient when your timeline playback is bloated and bogged down by various nodes and effects in your project. Another hidden feature in Resolve 15 is the ability to quickly purge your cache. As you edit, the program creates temporary files and stores them in a cache to help with editing efficiency. At the bottom right corner of your screen, you will find the percentage and amount of RAM used by Resolve. If you right-click the numbers, you have the option to purge your cache, helping you clear up memory previously used by the cache. 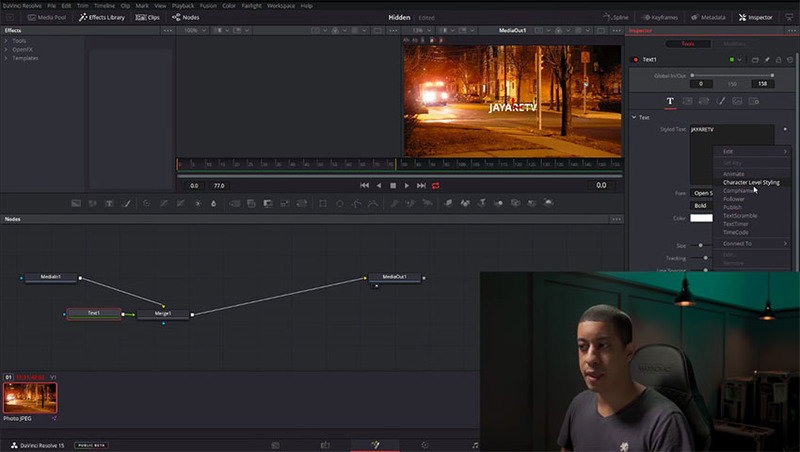 For those who aren’t familiar with Resolve’s text tools, Blackmagic Design has included presets in the program that allow you to easily animate your text nodes. 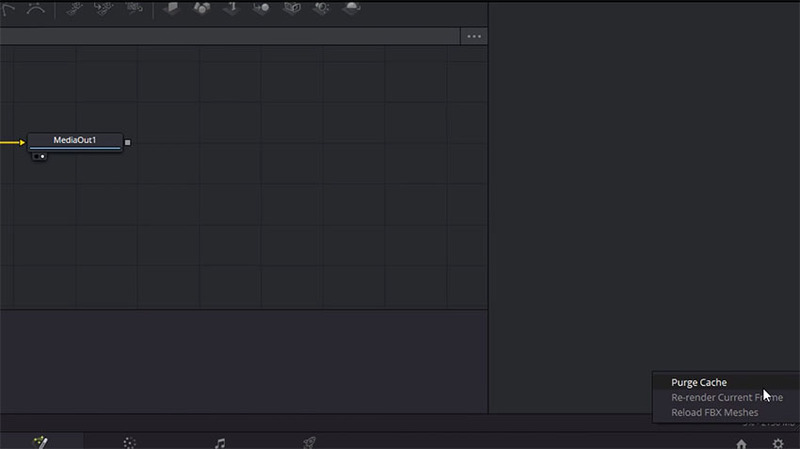 When you create a piece of text, right-click on the StyledText box in the Inspector. You’ll be presented with options such as Animate, Character Level Styling, Follower, TextScramble, TextTimer, Timecode. When you click on any of these, you will see the pre-made moves inside of the Modifiers pane. By using these presets, you’ll save time by not having to manually create keyframes for simple animations. When working inside of the Color tab, right-clicking a node will allow you to change features such as color space, gamma, and color channels. This is especially convenient if you’re someone working with clips that have different color properties, or if you want to experiment with the different color and gamma combinations. Inside of Resolve 15, you’ll also find the integrated Fairlight interface primarily used by creative professionals for audio editing. By right-clicking on any of the tracks, you can easily set the track’s property, choosing between Mono, Stereo, 5.1, or 7.1. In addition, right-clicking will give you the option to add new tracks on the fly. Lastly, you can easily add Expressions or Pick Whips to most properties found in the Inspector. To do this, right-click on the property you want to manipulate and then select Expressions. The use of this feature is especially useful for automating special animations, such as a repeating opacity shift. If you want to try out using Expressions, do a quick Google search for some of those snippets and test them out right off the bat.